My friend Sherry brought her yoga class by our facilities last week for a tour. The instructor is 84 years young - a vibrant, enthusiastic woman who's part-time job is teaching excercise classes at a local gym. The youngest in the group was at least 60 something. Jeff thoroughly entertained and educated the ladies during their visit and laughing all the way out the door, Sherry (who was sporting purple hair out of a can only because she said her pink hair paint didn't go with her complexion) said they had a blast. February is supposed to be the love month. I think it (and every other month) should be the love of life month. These ladies demonstrated that very well. I had hoped to have sprouted Emmer added to our product listing by now, but I can't find any. Hopefully the new supplies will be available soon. I'm happy to say that we now have new LOWER prices on our sprouted EINKORN products. I do have 2 new products available for you along with a couple of recipes to get you aquainted with them. Because you requested it I am excited to say that To Your Health now offers Sprouted Corn Meal and Sprouted Grits. A friend and customer of ours, Anthony Terrill, founder of Anthony's Smart Choices, has just launched a fabulous line of sprouted ASC Smart Pasta™ using our sprouted spelt and red wheat flours. ASC Smart Pasta's unique propriety blend of sprouted grains is packed with 5 different sources of plant protein. These pasta products come to you fresh, not dried, and the taste is superb. I told Anthony to hold on tight because once the word gets around about his pasta he's going to need a bigger place! Which sprouted flours do I use when? I get this question a lot, so I thought I'd list some combinations of our sprouted flours and what kinds of recipes they can be used in as well as at what ratios for great tasting baked goods. For yeasted recipes: Any of our sprouted flours that contain gluten - red and white wheat, spelt, einkorn, barley, rye, and KAMUT®. Red wheat flour has the highest gluten content for a great rise to your bread. For baking soda or baking powder recipes: Any of our sprouted flours, whether gluten or gluten-free. Sprouted flours that can be used as 100% of the flour in your recipe: Red and white wheat, spelt, barley, rye, KAMUT®, einkorn, brown rice, millet, oat, sorghum, and blue/yellow corn. These flours can be mixed and matched as well. Sprouted flours best when used as not more than 50% of total flour in a recipe: amaranth, buckwheat, and lentil. Rye is a heavy flour that fits in this category unless you're particularly fond of its strong taste. Sprouted flours best when used as not more than 20% of total flour in a recipe: black bean, garbanzo bean, and quinoa. Exceptions: black bean flour for tortillas, and garbanzo bean flour for some Indian breads in which these flours can be used at a higher ratio or as 100% of total flour in the recipe. www.foodstoragemadeeasy.net - Great information to keep us all organized. www.mysmartpasta.com - The best sprouted pasta I've ever tasted. Comes to you fresh, not dried. Preheat oven to 350°. In a large saucepan, combine the water, milk, and salt. Bring to a boil. Gradually add the grits and stir well. Reduce heat to low, cover, and cook about 15 minutes, stirring occasionally. Add 8 tablespoons of butter stirring until melted. Cover and continue to cook grits until thick and creamy, about 3-4 more minutes. Remove the pan from heat. In a small skillet, melt the remaining tablespoon of butter over moderate heat, add the scallions, and stir until softened, about 1 minute. Add the scallions to the grits along with the garlic powder and 1 1/2 cups of the cheese. Stir until the cheese melts. Add the tomatoes with chiles, stirring until well blended. Spoon the mixture into a shallow buttered 2-quart baking dish and bake for 30 minutes. Sprinkle the remaining cheese over the top and continue baking till golden, about 10 minutes. Serve it up hot. Great with spicy grilled or boiled shrimp. Preheat oven to 450°. In a large mixing bowl, combine the sprouted cornmeal, baking soda, and salt. Stir until well blended. Add the eggs and buttermilk. Stir with a wooden spoon until well blended and smooth. In a 9-10" cast-iron skillet heat the bacon grease, add it to the cornmeal mixture, and stir until well blended. Scrape the batter into the hot skillet, place the skillet in the oven, and bake until the cornbread is golden brown, about 20-25 minutes. 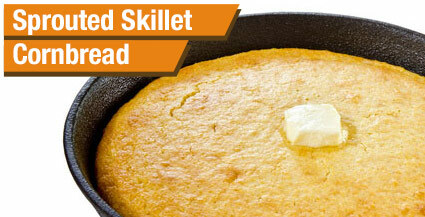 Turn the cornbread out onto a serving plate of serve directly from the skillet, cutting it into small wedges. Bring out the butter! Lots of butter! Preheat oven to 375°. In a large bowl measure the sprouted flour, sugar, poppy seeds, baking powder, baking soda, and salt. Stir well. Stir in eggs, olive or coconut oil, and orange zest. Fold in shredded carrots and buttermilk. If batter is dry add buttermilk, one tablespoon at a time until batter is soft, but not runny. Place paper liners in a 12-cup muffin pan. Spoon batter into cups, filling two-thirds full. Bake for 20-23 minutes or until golden brown. Cool slightly. Great with butter or cream cheese.